Auditory brainstem response (ABR) audiometry is a neurologic test of auditory brainstem function in response to auditory (click) stimuli. First described by Jewett and Williston in 1971, ABR audiometry is the most common application of auditory evoked responses. Test administration and interpretation is typically performed by an audiologist. This article provides an overview of the test and its most common applications. For purposes of clarity and brevity, specialized ABR techniques and more technical issues have been omitted. Auditory brainstem response (ABR) audiometry typically uses a click stimulus that generates a response from the basilar region of the cochlea. The signal travels along the auditory pathway from the cochlear nuclear complex proximally to the inferior colliculus. ABR waves I and II correspond to true action potentials. Later waves may reflect postsynaptic activity in major brainstem auditory centers that concomitantly contribute to waveform peaks and troughs. The positive peaks of the waveforms reflect combined afferent (and likely efferent) activity from axonal pathways in the auditory brain stem. In the United States, the waveforms are typically plotted with the vertex site electrode in the positive voltage input of the amplifier, resulting in I, III, and V wave peaks. In other countries, the waves are plotted with a negative voltage. The ABR wave I response is the far-field representation of the compound auditory nerve action potential in the distal portion of cranial nerve (CN) VIII. The response is believed to originate from afferent activity of the CN VIII fibers (first-order neurons) as they leave the cochlea and enter the internal auditory canal. The ABR wave II is generated by the proximal VIII nerve as it enters the brain stem. The ABR wave III arises from second-order neuron activity (beyond CN VIII) in or near the cochlear nucleus. Literature suggests wave III is generated in the caudal portion of the auditory pons. The cochlear nucleus contains approximately 100,000 neurons, most of which are innervated by eighth nerve fibers. The ABR wave IV, which often shares the same peak with wave V, is thought to arise from pontine third-order neurons mostly located in the superior olivary complex, but additional contributions may come from the cochlear nucleus and nucleus of lateral lemniscus. Generation of wave V likely reflects activity of multiple anatomic auditory structures. The ABR wave V is the component analyzed most often in clinical applications of the ABR. Although some debate exists regarding the precise generation of wave V, it is believed to originate from the vicinity of the inferior colliculus. The second-order neuron activity may additionally contribute in some way to wave V. The inferior colliculus is a complex structure, with more than 99% of the axons from lower auditory brainstem regions going through the lateral lemniscus to the inferior colliculus. Thalamic (medial geniculate body) origin is suggested for generation of waves VI and VII, but the actual site of generation is uncertain. Auditory brainstem response (ABR) audiometry is considered an effective screening tool in the evaluation of suspected retrocochlear pathology such as an acoustic neuroma or vestibular schwannoma. However, an abnormal ABR finding suggestive of retrocochlear pathology indicates the need for MRI of the cerebellopontine angle. In addition to retrocochlear pathologies, many factors may influence ABR results, including the degree of sensorineural hearing loss, asymmetry of hearing loss, test parameters, and other patient factors. These influences must be factored in when performing and analyzing an ABR result. In general, ABR exhibits a sensitivity of over 90% and a specificity of approximately 70-90%. Sensitivity for small tumors is not as high. For this reason, a symptomatic patient with a normal ABR result should receive a follow-up audiogram in 6 months to monitor for any changes in hearing sensitivity or tinnitus. The ABR may be repeated if indicated. Alternatively, MRI with gadolinium enhancement, which has become the new criterion standard, can be used to identify very small (3-mm) vestibular schwannomas. Although traditional ABR measures decrease in sensitivity as a factor of tumor size, recent studies have shown that by using a new stacked derived-band ABR that measures amplitude, very small tumors may be detected more accurately. This new technique, combined with traditional ABR audiometry, may soon make possible the detection of very small tumors with accuracy approaching 100% using ABR audiometry. Other applications of ABR continue to evolve. Recent research suggests that although the overall ABR wave latencies are within normal limits in patients with tinnitus, those patients have longer latencies than control patients without tinnitus. This suggests that ABR may be useful in monitoring and understanding tinnitus. ABR has also been used for prognostication in patients with coma. Researchers have found that patients with a Glasgow coma scale of 3 and who also have a significantly abnormal ABR had a greater probability of dying than those with a normal ABR  (see the Glasgow Coma Scale calculator). Auditory brainstem response (ABR) technology is used in testing newborns. Approximately 1 of every 1000 children is born deaf; many more are born with less severe degrees of hearing impairment, while others may acquire hearing loss during early childhood. Historically, only infants who met one or more criteria on the high-risk register were tested. Universal hearing screening has been recommended because about 50% of the infants later identified with hearing loss are not tested when neonatal hearing screening is restricted to high-risk groups. Recently, hospitals across the United States have been implementing universal newborn hearing screening programs. These programs are possible because of the combination of technological advances in ABR and otoacoustic emissions (OAE) testing methods and equipment availability, which enables accurate and cost-effective evaluation of hearing in newborns. Several clinical trials have shown automated auditory brainstem response (AABR) testing (eg, Algo-1 Plus) as an effective screening tool in the evaluation of hearing in newborns, with a sensitivity of 100% and specificity of 96-98%. When used as a threshold measure to screen for normal hearing, each ear may be evaluated independently, with a stimulus presented at an intensity level of 35-40 dB nHL. Click-evoked ABR is highly correlated with hearing sensitivity in the frequency range from 1000-4000 Hz. AABRs test for the presence or absence of wave V at soft stimulus levels. No operator interpretation is required. AABR can be used on the ward and during oxygen therapy without disturbance from ambient noise. ABRs may be used to detect auditory neuropathy or neural conduction disorders in newborns. Because ABRs are reflective of auditory nerve and brainstem function, these infants can have an abnormal ABR screening result even when peripheral hearing is normal. Infants that do not pass the newborn hearing screenings do not necessarily have hearing problems. When hearing loss is suspected because of an abnormal ABR screening result, a follow-up diagnostic threshold ABR test is scheduled to determine frequency-specific hearing status. Estimation of hearing at specific frequencies may be obtained through use of brief tone stimulation, such as a tone burst. Auditory brainstem response (ABR), often used intraoperatively with electrocochleography, provides early identification of changes in the neurophysiologic status of the peripheral and central nervous systems. This information is useful in the prevention of neurotologic dysfunction and the preservation of postoperative hearing loss. For many patients with tumors of CN VIII or the cerebellopontine angle, hearing may be diminished or completely lost postoperatively, even when the auditory nerve has been preserved anatomically. Wave I, which is generated by the cochlear end of CN VIII, provides valuable real-time information regarding blood flow to the cochlea. Because ischemia is a primary cause of surgery-related hearing loss, wave I is monitored closely for any shift in latency or decrease of amplitude. Wave I-II and I-III interpeak intervals can provide distal and proximal information during CN VIII surgeries. Wave V and the I-V interpeak interval latencies are monitored for shifts or alterations in latency and amplitude. The I-V latency provides information regarding the integrity of CN VIII to the auditory brain stem. 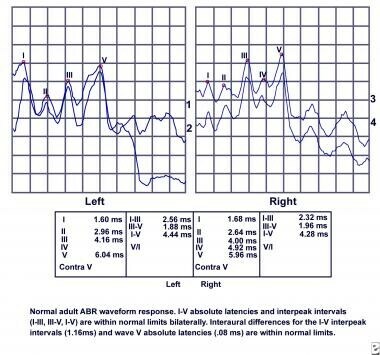 Wave V alterations occurring intraoperatively do not necessarily reflect changes in hearing status. Changes in latency may instead be caused by desynchronization of neurons or other outside factors. Also, a potential time delay exists between the actual occurrence of insult and when the shift in wave V appears. Patients with preexisting sensorineural hearing loss may have poor waveform morphology and no wave I response. Auditory brainstem response (ABR) audiometry has a wide range of clinical applications, including screening for retrocochlear pathology, universal newborn hearing screening, and intraoperative monitoring. Additional applications include ICU monitoring, frequency-specific estimation of auditory sensitivity, and diagnostic information regarding suspected demyelinating disorders (eg, multiple sclerosis). As technology continues to evolve, ABR will likely provide more qualitative and quantitative information regarding the function of the auditory nerve and brainstem pathways involved in hearing. Lin HC, Chou YC, Wang CH, et al. Correlation between auditory brainstem response and hearing prognosis in idiopathic sudden sensorineural hearing loss patients. Auris Nasus Larynx. 2017 Jan 31. [Medline]. Bramhall NF, Konrad-Martin D, McMillan GP, Griest SE. Auditory Brainstem Response Altered in Humans With Noise Exposure Despite Normal Outer Hair Cell Function. Ear Hear. 2017 Jan/Feb. 38 (1):e1-e12. [Medline]. [Full Text]. Barbee CM, James JA, Park JH, et al. Effectiveness of Auditory Measures for Detecting Hidden Hearing Loss and/or Cochlear Synaptopathy: A Systematic Review. Semin Hear. 2018 May. 39 (2):172-209. [Medline]. Silva AG, Frizzo ACF, Garner D, et al. A relationship between brainstem auditory evoked potential and vagal control of heart rate in adult women. Acta Neurobiol Exp (Wars). 2018. 78 (4):305-14. [Medline]. [Full Text]. Spitzer E, White-Schwoch T, Carr KW, et al. Continued maturation of the click-evoked auditory brainstem response in preschoolers. J Am Acad Audiol. 2015 Jan. 26(1):30-5. [Medline]. Dornhoffer JL, Helms J, Hoehmann DH. Presentation and diagnosis of small acoustic tumors. Otolaryngol Head Neck Surg. 1994 Sep. 111(3 Pt 1):232-5. [Medline]. Zappia JJ, O'Connor CA, Wiet RJ, Dinces EA. Rethinking the use of auditory brainstem response in acoustic neuroma screening. Laryngoscope. 1997 Oct. 107(10):1388-92. [Medline]. Chandrasekhar SS, Brackmann DE, Devgan KK. Utility of auditory brainstem response audiometry in diagnosis of acoustic neuromas. Am J Otol. 1995 Jan. 16(1):63-7. [Medline]. Gordon ML, Cohen NL. Efficacy of auditory brainstem response as a screening test for small acoustic neuromas. Am J Otol. 1995 Mar. 16(2):136-9. [Medline]. Schmidt RJ, Sataloff RT, Newman J, Spiegel JR, Myers DL. The sensitivity of auditory brainstem response testing for the diagnosis of acoustic neuromas. Arch Otolaryngol Head Neck Surg. 2001 Jan. 127(1):19-22. [Medline]. Cueva RA. Auditory brainstem response versus magnetic resonance imaging for the evaluation of asymmetric sensorineural hearing loss. Laryngoscope. 2004 Oct. 114(10):1686-92. [Medline]. Kehrle HM, Granjeiro RC, Sampaio AL, Bezerra R, Almeida VF, Oliveira CA. Comparison of auditory brainstem response results in normal-hearing patients with and without tinnitus. Arch Otolaryngol Head Neck Surg. 2008 Jun. 134(6):647-51. [Medline]. de Sousa LC, Colli BO, Piza MR, da Costa SS, Ferez M, Lavrador M. Auditory brainstem response: prognostic value in patients with a score of 3 on the Glasgow Coma Scale. Otol Neurotol. 2007 Apr. 28(3):426-8. [Medline]. Skold M, Kallstrand J, Nehlstedt S, et al. Thalamocortical abnormalities in auditory brainstem response patterns distinguish DSM-IV bipolar disorder type I from schizophrenia. J Affect Disord. 2014 Dec 1. 169:105-11. [Medline]. ASHA Joint Committee On Infant Hearing. Year 2000 Position Statement: Principles and Guidelines for Early Hearing Detection and Intervention Programs. Available at: http://professional.asha.org. The authors and editors of Medscape Reference gratefully acknowledge the contributions of previous author Melanie E Scott, MAud, to the development and writing of this article.